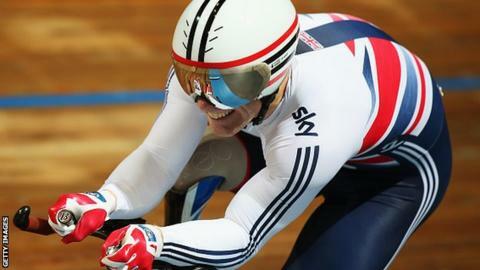 Great Britain broke the world team sprint record on their way to topping the medal table at the Para-cycling Track World Championships in Italy. Jody Cundy, Jon-Allan Butterworth and 18-year-old debutant Louis Rolfe secured victory in 49.230 seconds. Tandem sprint pair Neil Fachie and Pete Mitchell took their second title of the week to make it two golds for the day and eight for the week. In addition, Britain won five silvers and four bronze medals. Craig MacLean and James Ball claimed a bronze behind Fachie and Mitchell, while in the women's tandem sprint defending champions Sophie Thornhill and Helen Scott had to settle for silver. There was also an unexpected silver for Jon Gildea in the scratch race. Head coach Jon Norfolk told BBC Sport: "I think we are confident with our performers this week. It's a good spot check of where we are now and how people can deliver. "There'll still be plenty more we can add into the mix to make sure we can get the right result at the Paralympics in Rio."